While the prospect of massive crowds and bottlenecked public transportation looms over the heads of D.C.'s event coordinators in connection with the Inauguration, many of AU's departments have implemented new programs to maintain order on campus during the four-day weekend. "This is an event that Washington, D.C. has never seen," said AU Housing and Dining Programs Executive Director Chris Moody. "We just want to make sure that our students feel safe and secure with who is going to be on campus and in their halls." In an early projection, D.C. authorities estimated a crowd of 4 million to 5 million individuals would descend upon the National Mall for President-elect Barack Obama's inauguration. However, those figures were nixed in late December when an article in The Washington Post said the number had been lowered to roughly half that number. With that change in expected visitors, authorities on campus also adjusted their estimate of expected guests staying in the dorms. "It's not as many [guests] as we had thought initially," Moody said. He said he would not release the number of guests expected to be staying on campus for security purposes. A Jan. 5 e-mail Housing and Dining Programs sent to AU students outlined the threats that the increased number of visitors to D.C. and AU would present to the university. "It is critical that we protect our community from safety and security risks caused by individuals who should not be in the residence halls," the e-mail said. The e-mail also outlined the procedures that the university would implement in order to maintain security on campus. Students with guests coming for Inauguration weekend were required to pre-register their guests by Wednesday through the Housing and Dining Web site, which asked for cell phone numbers and other information of both the AU student host and their guests. While the number of guests allowed per student is not capped, AU students were asked to register each guest so Housing and Dining could monitor the total number of people in the dorms to prevent the residence halls would not exceed capacity. "Right now we don't see any impact on plumbing or the facilities itself structurally," Moody said. "We are keeping an eye on it, though, because we don't want toilets backing up and showers clogging and pipes bursting, which is a natural reality when you increase the designed occupancy of a building." Moody said planners from AU initially talked to George Washington University and Georgetown University in order to get an idea of what they were planning for the influx of people on their respective campuses for the weekend. "Most of our guest policy is pretty applicable," he said. "The only thing that is out of the ordinary for us is the guest ID cards." The identification cards, issued to all registered guests, will not be able to swipe into residence halls, but are merely a visual representation that shows the guest is staying at AU with a student's permission, according to Moody. He said no individual, including residents, would be allowed to enter any residence hall without AU-issued identification. "I think it's a good thing that they have an ID for the guests, because you never know who's going to show up," said Yazan Khalaf, a junior in the School of Public Affairs. "You always want to make sure that who's coming in to the dorms is supposed to be in the dorms." Shannon Hansen, a sophomore in the Kogod School of Business, said guest registrations would not make a difference for AU's safety or security. "The registration process is a good way to keep tabs on people, but it's going to be too difficult to follow through," she said. Much of the campus' staff, including Public Safety, resident assistants and desk staff, will be doubled throughout much of the weekend, according to Moody and Public Safety Chief Michael McNair. The frequency and operating hours of the campus shuttle will also be extended, according to Moody. Hansen said she thought all of the security measures being undertaken by various departments at AU are excessive. "There's so many loop holes to get around [the security measures], and it's going to be a lot harder for [Housing and Dining] to make sure everybody is accounted for," she said. The biggest safety threat that students will face during Inauguration weekend will be avoiding the pitfalls of binge drinking, McNair said in an e-mail. "Also making it to and from the Inauguration events safely due to high traffic volume," he said in the e-mail. Moody said he was confident in all of the security measures AU planned to implement during the Inauguration. "I think we've thought through everything," Moody said. "If people do what they're expected to do, then we'll have a great weekend." 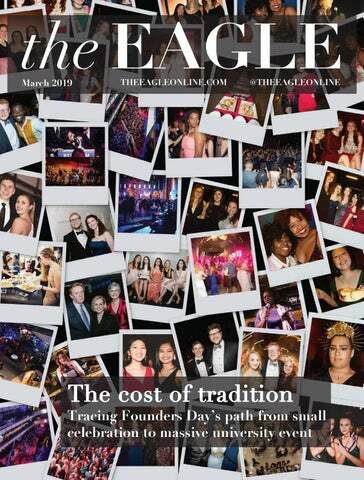 You can reach this staff writer at thallerman@theeagleonline.com.